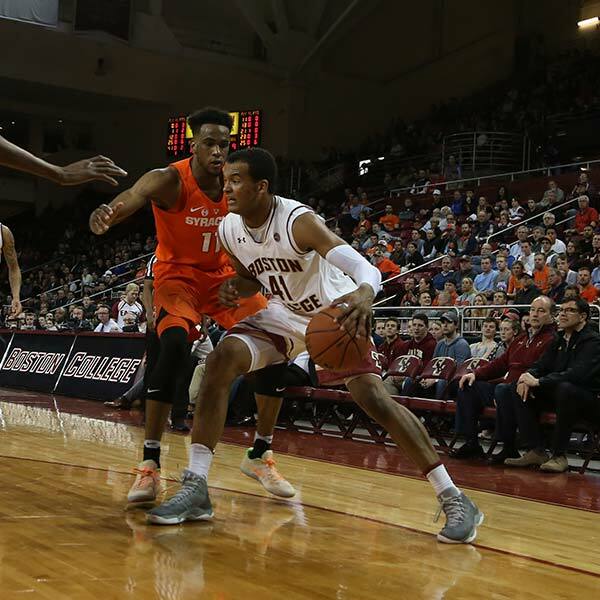 Flynn Fund donors can enjoy premier seating & on-campus parking in Alumni Stadium and Conte Forum as a benefit of supporting BC student-athletes. Join Martin Jarmond, William V. Cambell Director of Athletics, and Flynn Fund donor Franz Loeber as they drive to the stadium and discuss the best parts of game day. What is Donor Based Seating? The Flynn Fund Donor Based Seating & On-Campus Parking program rewards BC Athletics donors with access to season ticket options in premier seat locations for football and basketball. In addition, donors can access parking in some of the most desirable lots with close proximity to the stadium. 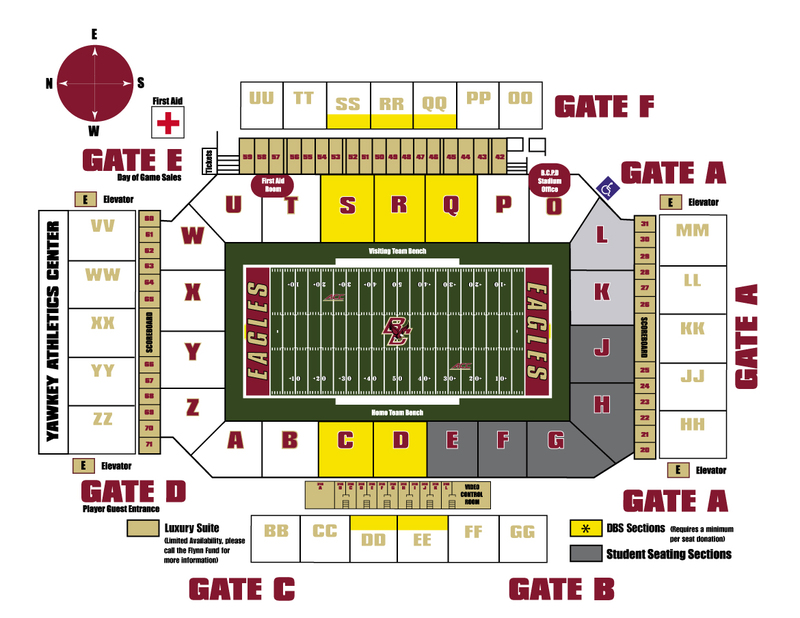 BC Eagle fans interested in access are asked to make a gift to the Flynn Fund in alignment with the greater of their preferred seat section in the stadium or their desired parking location. *Parking requests are subject to availability. Baldwin would like to purchase 2 season tickets in Section S of Alumni Stadium. Additionally he would like to park on the roof of the Commonwealth Ave Garage. Section S asks for a $750 gift per seat ($750 X2 = $1,500)*, The Commonwealth Ave Garage Roof parking asks for a $2,000 donation. Baldwin purchases his tickets and makes a $2,000 donation. *Please note: Payments in exchange for seating rights are not deductible under new tax laws. 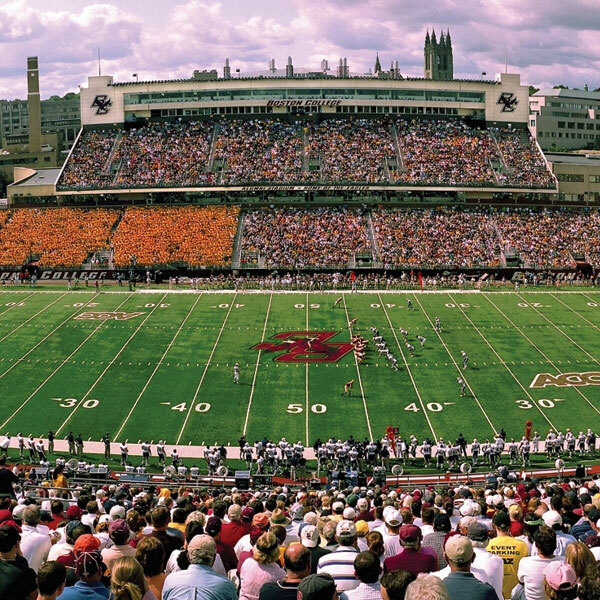 Fans purchasing seats in donor-based sections enjoy the very best sideline views as well as a padded seat cushions and several other amenities like discounts on concessions and the BC bookstore. Seats in all donor-based sections are currently available for the minimum donation requirement per seat. This gift also qualifies for on-campus parking. 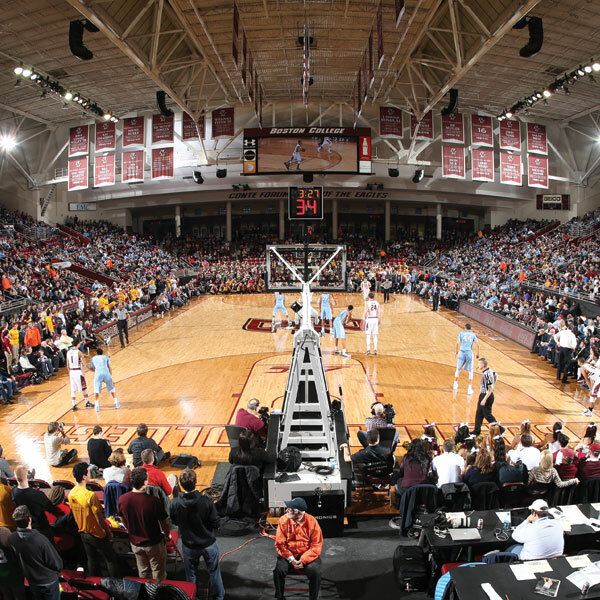 In appreciation for former student-athletes at Boston College, season tickets in donor-based seating sections are may be purchased without the required donation. The full donation for parking (if desired) and cost of tickets still required, however. Hover over a section to get pricing and see a view of the field from that location! Why should I give and purchase season tickets? 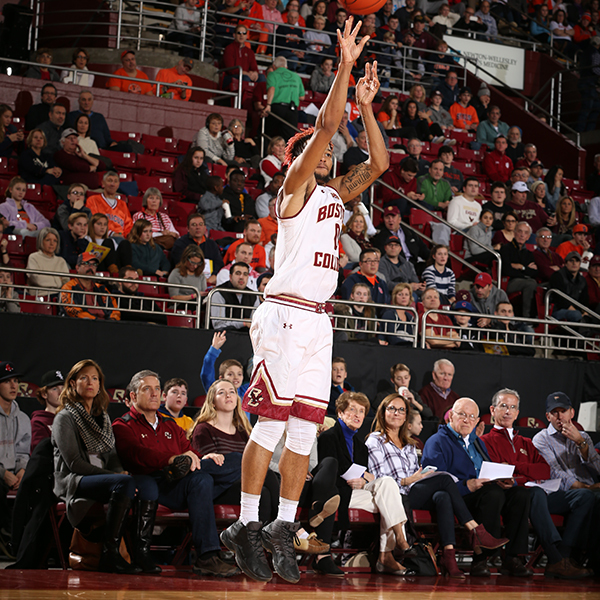 Your support financially and in the stands will take BC athletics to Greater Heights. A lively and full stadium on game day helps our Eagles perform on the field and makes a statement to recruits about the type of program they want to join. Financial support allows BC to invest in the elements of training and competition that help our teams compete for championships and make us proud to be Eagles. Game day on the Heights is also about coming together and having fun with family & friends. Rewarding those who invest in BC Athletics with the best seating and parking is a way for us to thank you for the important role you play. Are donor-based seats tax deductible? Starting January 1, 2018 as a result of the US Tax Cuts & Jobs Act of 2017, gifts made to provide rights to purchase seating at home athletic venues are no longer tax deductible. They continue to provide critical resources to BC Athletics. Any giving above seat requirements is tax deductible to the extent of the law. Please consult your tax adviser. What is the Athletic Scholarship Seating Fund? The Athletic Scholarship Seating Fund provides current-use dollars to support the annual scholarship bill. BC Athletics provides 272 full scholarships each year equating to approximately $20M in expenses. This fund will provide funding where the scholarship endowment falls short. The ability to offer scholarships is essential for our teams to compete for championships. I have seating and parking, do I need to make two separate gifts? One gift covers your seating and parking. The portion of your gift that provides Donor-Based Seating rights will be placed into the Athletic Scholarship Seating Fund and anything given above the seat gift level can go to the Flynn Fund. Seat gifts are not tax deductible. Section D carries a $1,000 per seat donation minimum. For the two seats he is asked for $2,000. Shea Field Parking carries an anticipated donation minimum of $5,000. The additional $3,000 above seating Baldwin gave to fulfill his parking ask is designated to the Flynn Fund. I would like donor-based seating in football and men’s basketball. Do I need to make two gifts? No! One gift covers both seating for football as well as men’s basketball. If the seating or parking requirements differ for football and basketball, you must give the greater amount of the two. For example, I would like 2 seats in section D for football and are asked to give $2,000 ($1,000 per seat X 2 seats). 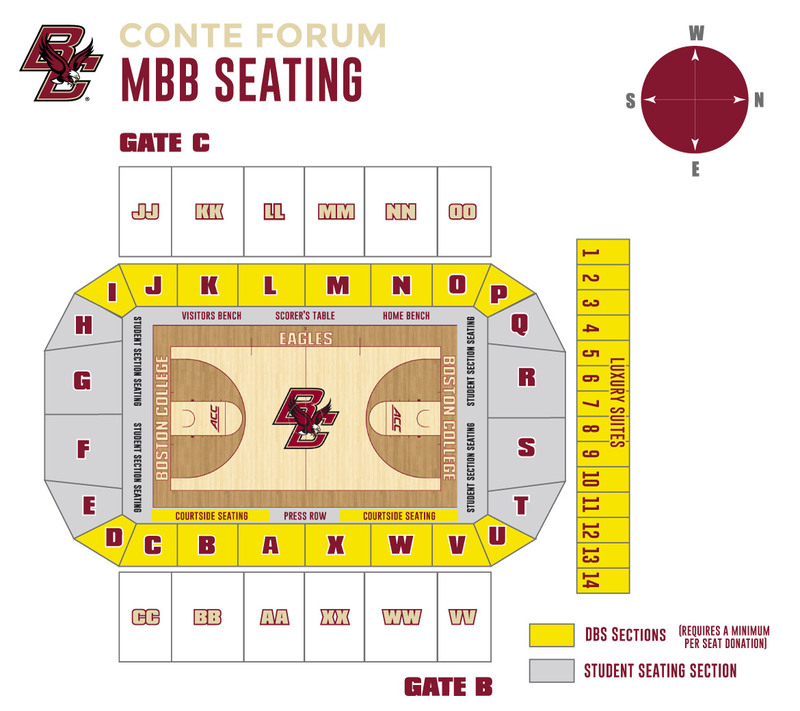 For Men’s Basketball I want four seats in section N and am asked to give $3,000 ($750 per seat X 4 seats). To qualify for both I need to give $3,000. How can I obtain on-campus parking? Individuals must make a donation to the Flynn Fund at or above the anticipated minimum for their preferred parking lot and have football season tickets in their name. Anticipated minimums are based on past giving data. Please contact The Flynn Fund at (617) 552-0772 or Flynn.fund@bc.edu for more information or to reserve your space today. What parking lots allow tailgating? 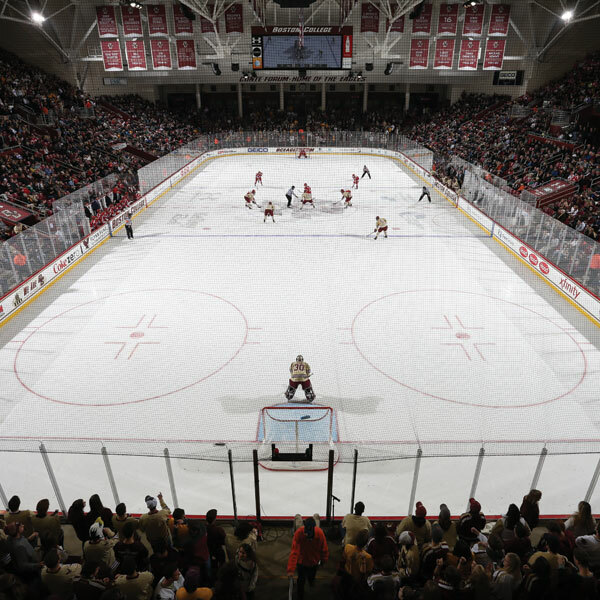 For the 2019 season there are tailgating privileges at McElroy, Comm Ave Garage/Roof, Beacon Street Garage/Roof, Upper Brighton, Hillside, Robsham/Cove, Campanella Way, Vanderslice, Shea Field, 2150 Comm Ave, Cushing, Walsh, Merkert, Plex. What is the difference between reserved and non-reserved parking? Donor parking in a reserved lot are assigned a numbered space that remains the same for all home football games. All reserved lots have full tailgating privileges. Donors parking in non-reserved lots are assigned a pass to the select lot and can park in any available space on game day. Tailgating is available in most non-reserved lots, with some restrictions on vehicle height and grills. Do I have to purchase the parking pass on top of the donation? No. As long as you meet the minimum anticipated donation for your requested lot there is no charge for the parking pass. I am a former BC student-athlete. Do I receive any parking discount? Former student-athletes may obtain DBS seats without the required donation. The full donation for parking and cost of tickets still required, however. Can I grill at my tailgate? Gas Grills are permitted in outdoor Flynn Fund parking areas. Charcoal grills and smokers are prohibited on campus. All grills are prohibited in garages. When do the parking lots open on game day? For all games on campus, parking lots will open three (3) hours before kickoff. Flynn Fund Permit holders should follow the directions listed on the reverse side of their permit for best access to their parking area. Traffic will be directed by the Boston College Police Department (BCPD) and signs will be posted to identify parking areas. I had parking last year, but want to change lots. How can I make this change? The Flynn Fund maintains the list of those requesting parking changes or upgrades to fulfill prior to each season based on availability. 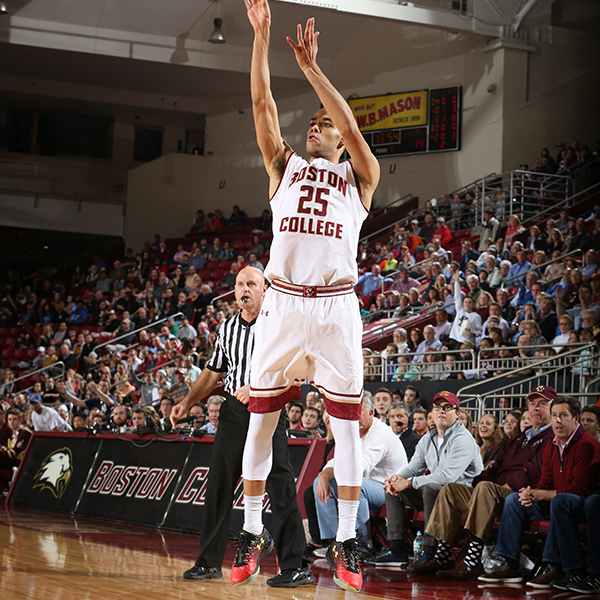 Please contact the Flynn Fund directly at (617) 552-0772 or Flynn.fund@bc.edu to place your request. Will I have the same reserved parking space as I did last year? Flynn Fund donors who had a reserved space last year will be allocated the same space next season so long as they meet the anticipated minimum giving level for their reserved lot. Giving levels vary for each reserved parking area. The Flynn Fund is pleased to provide athletic donors with on-campus parking options for football game days. To be eligible for on-campus parking, individuals must make a donation to the Flynn Fund at or above the anticipated minimum for their preferred parking lot AND have football season tickets in their name. One's donation serves as an umbrella to qualify for both donor-based seats in Alumni Stadium, as well as his/her parking space. 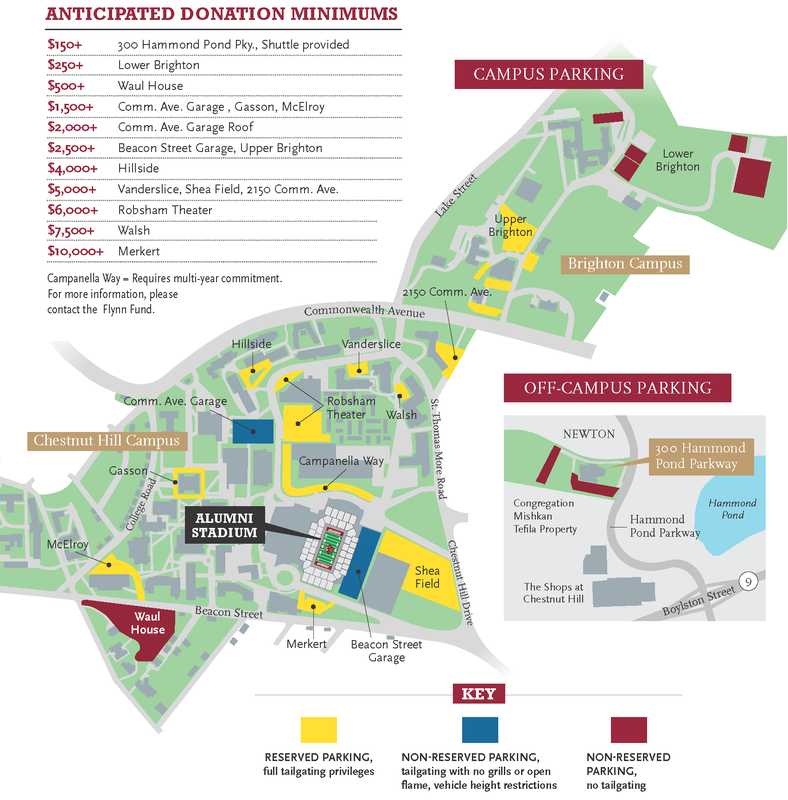 GOLD alumni are also able to receive individual donation credit for pooled parking gifts. The maximum number of GOLD alumni contributing to a pass has been set at 20. To make your gift, visit bc.edu/goldparking. To qualify for the discount, the donor must be a BC undergraduate alumni, graduating between 2009 and 2019. To obtain parking, a GOLD alumnus must have season tickets in his/her name. Pooled gifts can have a maximum of 20 contributors. Additionally, pooled gifts will be eligible for one parking pass at the GOLD discount level. Any additional passes will require an additional full contribution (for a maximum of 3 passes). All gifts for the entire group must be made to an athletics designation by May 31. Gifts made after May 31st are NO LONGER ELIGIBLE for the GOLD discount. Sections S, Q & C are eligible for the young alumni discount with a $375/seat donation requirement. This gift also qualifies for parking privileges. Fans purchasing seats in donor-based sections enjoy lower bowl side court seating. Seats in most donor-based sections are currently available for the minimum donation requirement per seat. This gift also qualifies for an on-campus parking pass at the qualifying level. Hover over a section to get pricing! University-issued permits are available to season ticket holders that make a qualifying Flynn Fund gift. In past years, the minimum donation for a Beacon Street Garage permit was $500 annually. 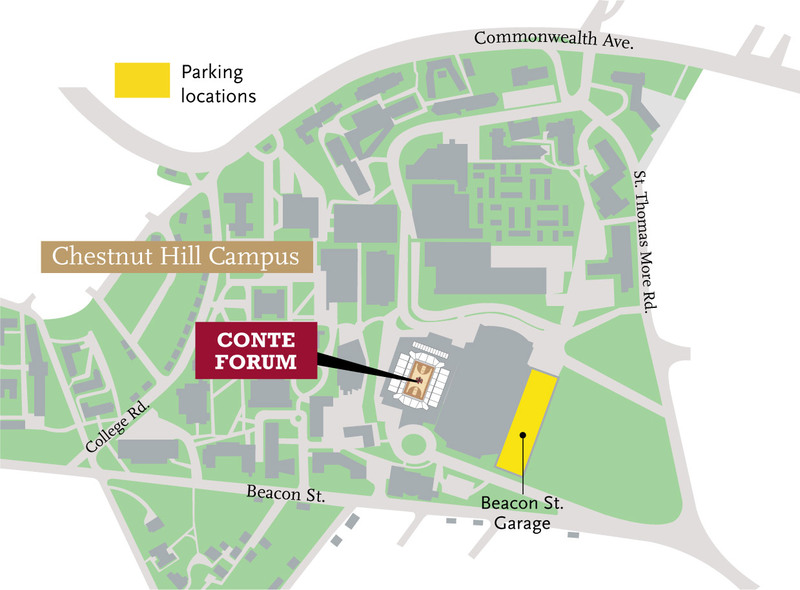 The Beacon Street Garage is reserved for permit holders only and is restricted until 15 minutes after the start of the event when all on-campus parking opens to the general public. Luxury Suites provide an intimate game day experience with elevated amenities for patrons and their guests. Suites are sold almost entirely on a season basis. Some single game rental opportunities may exist. For more information regarding availability please call the Flynn Fund at 617-552-0772. Courtside seats provide a unique game experience as fans sit just a few feet from the action. Seating is limited. For more information, please call the Flynn Fund at 617-552-0772.